EL CAJON, Calif. (AP) — Police released two videos Friday showing an officer fatally shooting an unarmed black man in a San Diego suburb and said they hoped showing the footage would ease escalating tensions. The videos show the officer fired four times at close range almost immediately after Alfred Olango, 38, suddenly raised both hands to chest level and took what was described as a shooting stance. 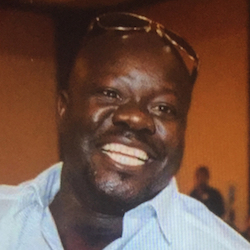 The shots came less than a minute after police arrived at the scene in response to Olango's sister calling 911 and reporting he was acting erratically. The videos were released after three nights of unruly and, at times, violent protests in El Cajon, and on the eve of a demonstration organized by clergy and supporters of Olango's family, who had pressured authorities to show the footage of the fatal encounter. On Thursday night, an officer was struck in the head by a brick hurled by a protester. "Our only concern at this point was community safety," police Chief Jeff Davis said. "We felt that the aggression of some — some — of the protesters was escalating to the point where it was necessary to release some information and truly, it was my hope to relieve some of that concern." A fourth night of protests on Friday remained peaceful at least for its first few hours, with 100 or more people blocking intersections and at one point attempting to walk on to a freeway before police stopped them. The Rev. Shane Harris of the civil rights organization National Action Network said the low-quality videos, shot at a distance, didn't clarify what led to the shooting and said they're likely to make people angrier. "What we saw today, that isn't enough," said Harris, who is assisting Olango's family. "It shows a cowboy with his gun drawn provoking a mentally disturbed person," Gilleon said. In the second video, taken on a cellphone by a witness in the drive-thru, Olango's sister is seen approaching Gonsalves from behind and a woman can be heard screaming at Olango to put up his hands and telling police not to shoot. Davis defended the release and said it was intended to de-escalate tensions and correct what he felt was a "false narrative" that was developing. Some witnesses said Olango had his hands in the air and was begging not to be shot. Olango's family and demonstrators demanded to see the full video, saying the single frame was selectively misleading to support the police version of events. They also questioned why it took them more than an hour to respond to three calls for help and then less than a minute to use deadly force. Davis, who said the investigation was ongoing, did not address whether officers acted appropriately in how they responded to the incident. Andre Branch, president of NAACP San Diego, commended the city for releasing video. "Full disclosure to the public builds trust, and it demonstrates respect," Branch said.